Lucky Lake Hostel is a true gem. It combines affordable prices with privacy and fresh air. It is just south of Amsterdam near Vinkeveense Plassen, a lake dotted with sailing boats in summer. It is only 30 minutes by public transport away from Amsterdam city centre and only 10 minutes by car. Lucky Lake HOSTEL sounds as if only young people stay there. But this is not true. The over 60s are generously represented and so are the 40+. 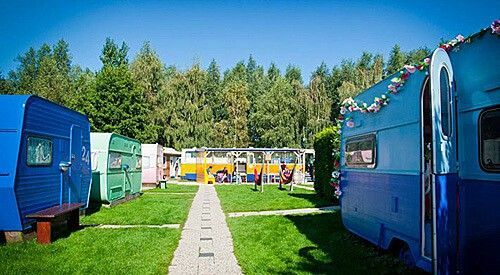 Lucky Lake Hostel is a misnomer because guests stay in small camper caravans, arranged in a circle for ultimate ‘gezelligheid’ (coziness) as the Dutch say. Each of the 31 caravans is a comfortable free-standing room on wheels surrounded by a green plot of land. The rooms are as comfortable as the ones at your home. Prices for double and single caravans are very affordable and dorm beds are even more budget-friendly. These are also chalets each consisting of three separate rooms for 4 people sleeping in bunk beds. One dorm is female only. The communal showers and toilets are functional and clean, separate ones for men and women. The common room is a tent where you can relax, play board games (provided) or socialise with other guests or staff. Gas rings, pots and pans and other kitchen stuff are free to use including two fridges and a BBQ. This is the perfect place to prepare breakfast if you are too thrifty treat yourself to a hostel breakfast; cereals, yoghurt bread galore and chees etc. but it is not included in the price. No need to tramp to Amsterdam every day, rent one of the hostel’s canoes or bikes or swim in the lake or the local pool. If you want to do things the Dutch way, cycle all the way to Amsterdam centre. It is safe and easy to find. The route is via well sign-posted cycle paths. Too tired to pedal back? Don’t worry, you can take your bike with you on the metro or take the free shuttle bus. Lucky Lake is open from March to October. There is no heating, but enough covers are provided. If spring or autumn nights get a bit chilly you can borrow more blankets or rent a heater.